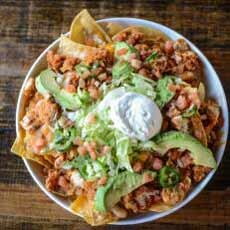 November 6th is National Nachos Day, In fact, the dish was invented by accent, when customers arrived at a restaurant after the kitchen had closed. The manager, named Nacho (the diminutive of Ignacio), threw together some ingredients in the fridge to feed the folks. The rest is history (here’s a bit more on history of nachos): a favorite snack was born. They moved from Mexican restaurants to the mainstream. Basic nachos are so easy to make; no wonder they’re a party favorite. At their most minimal, you need tortilla chips, cheddar cheese and salsa. The next step: avocado, beans and/or refried beans, chile, cilantro, corn kernels, jalapeños, scallions, sour cream. From there, anything goes, as we’ll demonstrate in today’s tip. Nachos are easily adaptable to regional American flavors like barbecue, corned beef, grilled shrimp and gumbo, local cheeses, horseradish, pot roast, southern-fried chicken, Wisconsin blue cheese. It’s easy to go global, too, as more recent menu additions include nachos with Hawaiian, Indian, Italian, Japanese and other culinary influences. While nacho traditionalists may roll their eyes, fearless foodies might delight to a plate of nachos with prosciutto and melted gorgonzola, tiny meat balls with Bolognese and parmesan atop crunchy tortilla chips, or fresh crab and béarnaise. “It’s all in the build,” says Flavor & The Menu, a magazine and website where chefs check out national trends. Flavor & The Menu took a look at how chefs around the country are interpreting nachos. You can create any of the ideas at home. Add cheeses and sauces from just about any cuisine. Swap out the tortilla chips accordingly, for a base of arepas, mixed vegetable chips, paratha, pita chips, plantains, pork rinds, rice crackers, roti, wontons, yucca chips (we stop short of suggesting matza chips with chopped liver, chopped onions and parsley). Instead of raw or pickled jalapeño, include kimchi or shishito peppers; or use a gochujang hot sauce instead of salsa. ASIAN FUSION Komodo in Los Angeles: Kimchi Nachos include chicken and bacon, sriracha aïoli, kimchi and cheese on fried corn tortillas. BARBECUE Little Goat Diner in Chicago, IL: Machos Nachos pile barbecue pork, beans, pickled peppers, cheddar, sour cream and avocado on housemade masa chips (masa is the ground corn from which tortillas, and tortilla chips, are made). GREEK Meraki Greek Bistro, Miami, FL: Greek nachos, with tomatoes, cucumbers, olives, feta, yogurt sauce and olive oil on pita chips. 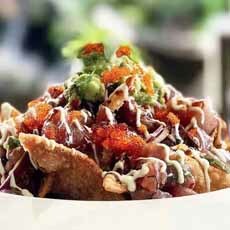 HAWAIIAN Next Door in Dallas, TX: tuna poke nachos are made with cucumber, pine nuts, wasabi crema and wonton crisps. HAWAIIAN Chive in Vero Beach. FL: poke nachos top unsalted corn chips with minced ahi tuna, seaweed, tomato, wasabi mayonnaise and horseradish cream. INDIAN Bollywood Theater, Portland, OR: Chaat and ’Cho, inspired by an Indian street snack, a base of wheat-and-nigella-seed crackers with boiled potatoes, tomatoes, black chickpeas, sev (tiny fried chickpea noodles), yogurt, green chutney and tamarind chutney. INDIAN Chauhan Ale & Masala House, Nashville, TN: Lamb Keema Papadi Nachos, an Indian take that layers spicy curried lamb, tamarind chutney, provel cheese and cucumber-tomato kachumber (cucumber salad) on papadi chips (made from chickpea flour). ITALIAN Five in Fresno, CA: Tuscan Nachos with spicy Sicilian sausage, mozzarella, provolone, Alfredo sauce, sour cream, avocado, pico de gallo and cilantro on fried wonton chips. JAPANESE Samurai Burrito, Fountain Valley, CA: Sashimi Nachos with raw fish, sesame seeds, wasabi mayo and togarashi spice on wonton chips. 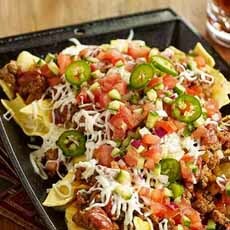 KOREAN 610 Magnolia in Louisville, KY: Gochujang Chili Cheese Nachos, a Korean-Texas of beef chili simmered in beer and chipotle infused with gochujang, cheddar, serrano peppers and sour cream spiked with more gochujang, with multicolor tortilla chips. MEXICAN NOUVELLE Country Cat in Portland, OR: Chicharrones Nachos are all things pork, topping a layer of pork rinds with crispy pork, red curry-spiked Velveeta, a cilantro-radish salad and a squeeze of lime. SOUTHERN Honey Butter, Chicago, IL: Fried Chicken Nachos with fried chicken strips, corn pico de gallo and pimento cheese sauce, finished with a drizzle of lime crema and candied jalapeño, over tortilla chips. SOUTHERN Party Fowl, Nashville, TN: spicy chicken topped with avocado, cheese, green onion, lettuce, pico de gallo, sour cream and white beans on bacon-fried tortilla chips. VEGETARIAN Petty Cash Taqueria, Los Angeles, CA: vegetarian Roasted Cauliflower Nachos with crema poblano, Jack cheese, rainbow cauliflower, kale and pickled Fresno chiles. 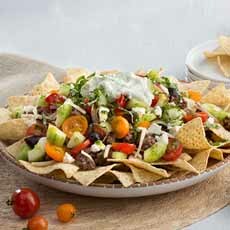 Greek-style nachos with feta, olives and yogurt sauce at Meraki Greek Bistro in Miami (photo Mission Foodservice). Indian lamb nachos with tamarind chutney at Chauhan Ale & Masala House in Nashville (photo Plateline). 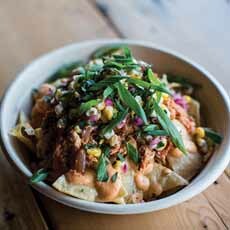 Fried chicken nachos with pimento cheese sauce at Honey Butter in Chicago (photo Tim Musho). Spicy chicken with the fixings on bacon-fried tortilla chips, at Party Fowl in Nashville. Poke nachos, fusing Hawaiian poke with seaweed, wasabi crema and wonton chips, at The Westin Princeville Kauai. 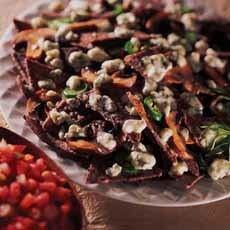 Portabella nachos with blue cheese and jalapeños atop blue corn tortilla chips (photo Flavor & The Menu). VIETNAMESE Chef-consultant Robert Danhi: bánh mì -inspired nachos with grilled lemongrass pork, pickled vegetables and fresh herbs atop rice-tapioca crackers, drizzled with roasted chile sauce. So let’s forget the black beans, cheddar and salsa for the moment. What’s your fusion nacho?